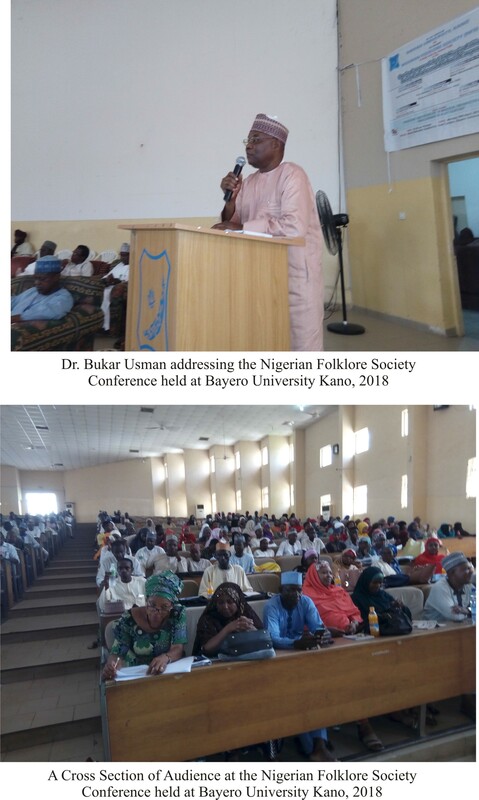 It was a gathering of scholars and writers as the Nigerian Folklore Society held its 13th Annual Conference at the Musa Abdullahi Auditorium, Bayero University, Kano, with a determination to entrench folklores in our national life. The personalities in attendance showed how serious the organisers took the yearly confab. They included the Chief Host and Vice Chancellor of Bayero University, Kano, Professor Muhammad Yahuza Bello; the host, the national president of the Nigerian Folkore Society, Dr. Bukar Usman OON, the Deputy Vice Chancellor, Administration, Professor Adamu Idris Tanko; Chairman of the occasion, Dr. Wale Okediran; while the Emir of Kano was represented by Professor Isa Hashim, Jarman Kano. Five lead papers were presented by Professor Abdu Yahya Bichi, Professor Angela Miri, Professor Aliyu Muhammad Bunza, Professor Saidu Babura Ahmad and Professor Nkem Okoh. After the opening ceremony the first plenary session was held at the Centre for Research in Nigerian Languages, Translation and Folklore, which doubles as the secretariat of the Society. On the second day of the Conference three concurrent sessions were held morning and afternoon, and over ninety papers were presented and discussed. It echoed the need to revive our folklores to help equip our children absorb the shocks of globalisation and incursions of the digital media, even as it noted that media technology to be extended to the disseminating the diverse rich values of our customs and traditions. The group observed further: “There is dearth of storytelling as there are few storytellers, leading to fewer stories, or even none in some communities. As a discipline of oral literature, folklore plays an important role in education, culture and the formation of social ideologies of the society and greatly helps in character development of children. Thus, it recommended that parents should be encouraged to speak indigenous languages to their children and also engage them in discourse embellished with proverbs, in addition to de-emphasising the craze for English content in programmes on TV and radio, and mode of dressing. Other recommendations contained in the communique were that “Nigerians need to know their native languages so that they can communicate internationally in a way that the whole world can recognise us through our linguistic identity” and “institutions of learning should be encouraged to organise story telling competitions. The Local Organising Committee extended its appreciation to the chief host, the university’s Vice Chancellor, for his generous moral and financial support; the president of the society Dr Bukar Usman, OON, the five lead paper presenters, the chairmen of the sessions and all others who either presented papers or officiated during the conference. Due to time constraint and the number of papers presented at the conference, the Congress of the society could not hold in Kano. Hence, the society agreed that the congress would hold at the next year’s national conference in Abuja, informed Professor Abdu Yahya Bichi, the LOC Chair.